The month of November continues to move along, and thus far we’ve been very mild. Today will be no exception to that as highs should again be well into the 60s and perhaps even some 70s out there before a seasonably strong cold front moves into the region later this afternoon and this evening. Tomorrow and especially Saturday will be more typical of November weather standards around here…nothing to cold but just more seasonable. Today: Once again mostly cloudy skies, breezy and mild weather. There may be a few scattered showers thrown in as well with highs near 70° into the mid 70s IF we can get enough sunshine ahead of the front. We should probably start with the weather map this morning because it shows our next change in the weather that is moving through the Plains states as I type this…it’s a cold front out towards the west of KC. The temperatures are in RED and the dew points are in GREEN. Notice that our dew points are near 60°. That’s one of the reasons, aside from the south winds overnight, that we start out today very mild (actually closer to our average high temperature). The cold front is denoted by the blue line with a couple of triangles moving through the Plains. This will be moving into the area this evening between 7-10PM or so for KC proper. So we’ll stay in the mild air mass ahead of the front through the evening rush hour. Then after the front moves through we’ll go into the cooler air mass overnight into tomorrow morning. There will be an increased chance of showers and storms with the frontal passage, and ahead of it too for that matter, so in reality later this afternoon, after about 3-4PM, the rain chances start to go up, then they tank after the front moves through the region overnight…so we have about a 6-8 hour window for better rain chances in the metro it appears. Let’s see how things play out later this afternoon. One note is that the winds aloft are going to be pretty strong. Upwards of 55-75 MPH at around 15-20,000 feet or so. 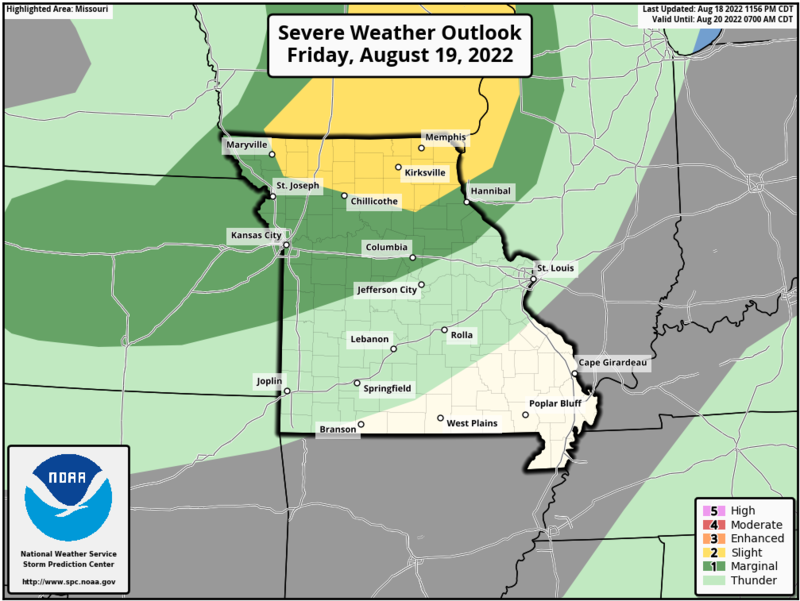 IF storms can form and grow vertically they may be able to tap into that strong wind field aloft and I guess a isolated severe storm would be possible…right now perhaps the slightly better chances of that happening are farther NE of KC…and also farther towards southern MO and SE KS. Then overnight the cooler air will move into the region…the temperature forecast at 12AM tomorrow shows the area in widespread 40s…with more cool air flowing into the region. Click on the maps above and below for a better view. Our next significant storm is due sometime NEXT WED into THU…that one will need to be watched as well…wouldn’t be surprised if parts of the Plains or upper Midwest has some severe weather with that one. This is not surprising for El Nino falls thus far. Have a great day and enjoy the warmth while you can!